Ok, so it isn't really mud right now, but it was a one point. Actually, a couple different points it was mud. Last week I even brought my camera to the studio to have my picture taken while I was working. Twice. I even remembered that I had it one day, and asked someone to take my picture once I started working. We both forgot. 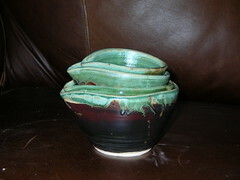 But this really is pottery that I made with my own 2 hands. The group shot, hangin' out on the love seat. This is the big casserole. It may not look so big to you, but trust me, when you are wrestling that clay, it is HUGE! Next we have the little brother. It's still not very little. The glaze is a little thin on this one, but I'm ok with it. they will nest so nicely? Well, this isn't mud, but I will share what I had for dinner tonight. Barbeque Chicken Pizza. On the grill. I finally got at least a little picture. I made pizzas on Friday night (no, I didn't have my Solstice Party, but at least I had some friends over for pizza and beer) I was a little wiser this time, I didn't make everything at once. I did a couple small batches so we wouldn't eat too much or leave too much. 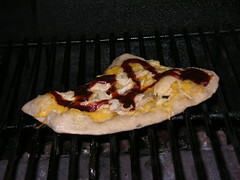 So today, I grabbed a hunk of dough out of the freezer (already rolled out) and threw it on the grill then threw the toppings on. I'm not sure if it would have been less crispy if I let the dough thaw a little more, but it was still pretty tasty for a super quick dinner while HP was in class. And now I'm hungry. I played a game of Bookworm while you were uploading...Tall Paul was grateful for lake inquiries, as usual, they hadn't started looking yet. Great chatting w/ya, off to find some food and then, to bed. Those are so cool. I love the casseroles, just love them. You made those bowls and dishes? I'm jealous. Hi! 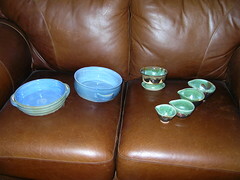 This is my first glimpse at your blog (I found it through Noble Pig) and I loved seeing your pottery. I am jealous at your talent! And the grilled pizza - don't you love that stuff? Hubby and I do that when I get my rear in gear and make the crust. I am trying to convince my mother to try it. SL- Yes I can bake in them. I'm looking for a simplified cassoulet recipe to make in the big one. Cathy- Thanks, I was very excited by them! Krysta- yep, I made them. I know, I have a hard time believing it myself.